Good news received from Phil Lucock of the Kyrenia Amateur Dramatic Society (KADS) of their forthcoming events for 2017. 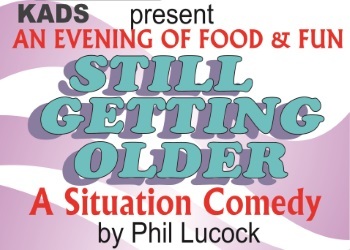 Starting off the year there will be a continuation of last year’s “The Older They Get”, a new situation comedy by Phil Lucock entitled “Still Getting Older” which features the same 4 characters, as usual in all kinds of bother and a hilarious visit to a local cricket match. 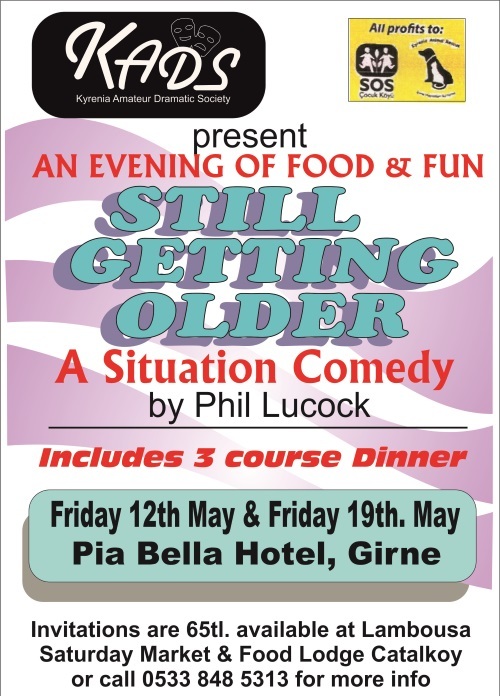 This performance is directed by June Lucock and will be at the Pia Bella Hotel, Girne on Friday 12th May and Friday 19th May. Invitations are 65TL per person, which includes a 3-course dinner, and are available at Lambousa Saturday Market, The Food Lodge in Catalkoy or by telephoning 0533 848 5313. KADS will be at the Pia Bella again in the autumn but this time with 3 short comedies, one of them a never recorded short by Ronnie Barker called “Rub a Dub”, another Ronnie Barker offering, ” At The Bar” and a comedy written in part by KADS members Beverley Westbrook and Lisa Server, “The Complete Works Of Shakespeare in 15 Minutes”. There will also be 2 radio plays this year, “15” which will be directed by Diana Peek and “The Protestors” written and directed by Phil Lucock. These will of course be broadcast by Bayrak International and produced by Can Gazi. Finally, KADS will be at the Pia Bella just before Christmas with their annual “Christmas Who Dunnit”, once again written and directed by Beverley and called “Christmas Cracker”. It looks as though KADS are going to be very busy with rehearsals through the year for all these performances but there is a lot to look forward to and of course Kyrenia Animal Rescue (KAR) and SOS Children’s Village benefit from the proceeds of all KADS performances.